What will it be used for? Some of the funding will go towards providing food and refreshments for participants (at least 80 on the Saturday, and up to 50 on the Friday). They would then like to be able to support a fringe activity with a partner organisation or artist in residence, so that they can offer different ways for citizens to get involved. They may also need to cover the travel costs of some community participants. Details of the applicant: Diane Sims is a community activist, digital practitioner and local democracy advocate. For her, local democracy is about being able to get things done where you live, having a voice, and being connected to decision-making processes. It’s also about growing personal relationships. She believes that citizens working together have what we need to create a stronger local democracy. Although she co-ordinates Notwestminster as a volunteer, it is closely linked with her professional work. Her role at Kirklees Council includes supporting their Democracy Service to work with citizens and partners, with a particular focus on digital engagement. Diane is currently working on a number of projects in response to the Kirklees Democracy Commission’s recommendations about how we can grow a stronger local democracy. For example, She’s leading a project to support councillors in developing digital skills and confidence for civic good, is also supporting a group of young commissioners to design and deliver public engagement activities to help them plan for the future of Kirklees youth council, and is helping to develop a ground-up approach to citizen engagement in Kirklees, which focuses on the strong local identity of their neighbourhoods, villages and towns. All of these activities involve bringing people together and using skills and experiences for a common purpose. 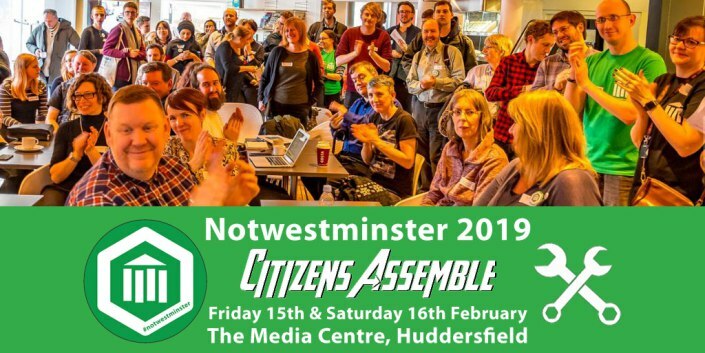 Notwestminster is about connecting people so that we can do something positive, because our local democracy is a shared endeavour – and often a shared frustration – but above all it’s a shared hope.